Wow this summer went by fast. I can’t believe it is already August. There is so much that I did this summer that I need to take a moment to recap before starting the New Year. Do you try to hold on to summer as long as you can? Well I am eager to get things all set up so I am spending the remainder of my summer WORKING to set up my classroom, but things are happening ALL to fast, so I’m going to relay all of the fun things I did this summer before going back to work. *One weekend trip to New York for to see the in-laws and celebrate a high school graduation in the family! *Reading MANY many novels, mostly for class... but it's always good to take the time to relax. and read! So, the majority of my summer was taken up by the Daycare summer camp position that I also did last year. This year’s field trips were MUCH better than last year, so it kept me busy, but I also had A LOT of fun! Some of the fieldtrips included Edventure Children’s Museum (BEST TRIP EVER!! ), bowling (twice), Sesame Street LIVE, going to a baseball game, going to the public library, a canal boat ride, farm trip for horseback riding and a hayride, and we even went to the neighborhood YMCA to swim every single Wednesday for a whole hour. Then, on my birthday, we went to a state park and our nature leader was SO MUCH fun, so it was actually one of my favorite fieldtrips-regardless of the fact that it was the best holiday ever (Flag Day, of course!). On my birthday, I also went to Chikfila for breakfast and got a FREE chicken biscuit, because I wore red, white, and blue in spirit of Flag Day! Yes, it was awesome. We met another couple of friends at a Hibatchi restaurant that evening to celebrate my birthday, and OF COURSE the staff came over to sing… sooo embarrassing! But I got a free cupcake and all the food was so delicious that I completely stuffed myself and couldn’t even eat the cupcake. I also completed FOUR classes towards my master’s degree within the two months of summer, and I am officially THREE classes away from GRADUATION!! :D Due to working half-days for two whole weeks while I was in class, and the week-long vacation that I took to Cancun, I missed many of the other fun fieldtrips that my class got to go to. They went to Publix for a FREE tour and free samples of fresh fruit, vegetables, baked goods, and sushi! They went to Bruester’s for a FREE trip to make a batch of icecream and eat some! They went to a pottery place, and some other cool places that the kids really enjoyed. I was sad to miss some of those places L. But then again we had plenty of fun when I was there. I conveniently told them that last Friday would be my last day so I could relax this week and try to get materials and ideas ready for this coming school year. Although I am thankful to be teaching in the same classroom as I did last year, I feel like there is more than ever to do. As a new teacher beginning in December of last year, I hit the ground running and never felt like I was actually settled. This year, I have a much better idea of what my class will be like, but it is still difficult to prepare a classroom when you have more than two grade levels in the same classroom the same time. 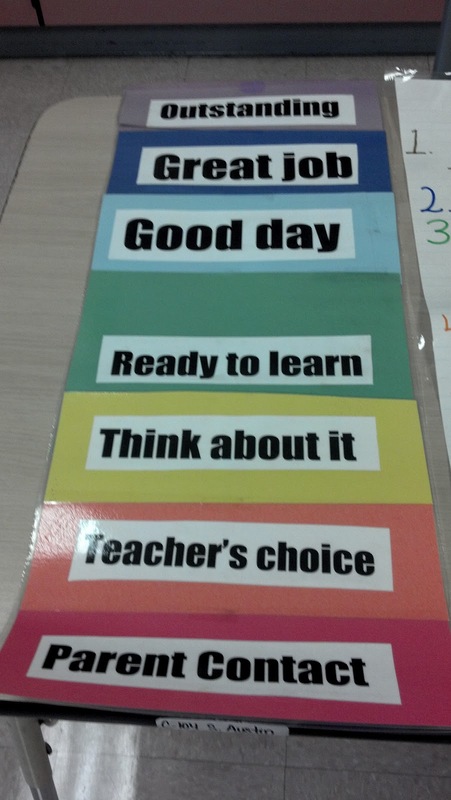 I student taught second and third grade resource, in the same room by alternating with the parapro every other day. Then last year I juggled a Kindergartner and a fifth grader all day, along with another Kindergartner for a half hour, two first graders for an hour, and a third grader for two hours. After that, I think I can figure anything out ;)… It just takes me some time to figure everything out. So I will keep you updated with how I figure it out. I have a rough draft of my schedule, but I may have to change it if they add a new class last minute (they are apparently adding another PRE-K class). With this week off, I thought I would have time to RELAX (Relax? What’s that?) and get errands done, and get ready for school. Turns out, it was really good that I decided not to work this week, because my agenda is full all week. On Monday, I had attended an interview for my new parapro, and then Milly to the vet to get her heartworm refill. 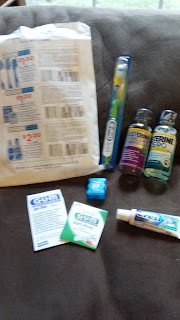 On Tuesday, I had to go to the dentist *(I hadn’t been in over a year- since before I moved here), but I got ran awesome goody bag! Even the bag had COUPONS on it (Bonus! ), which I was really excited about! Then, I went over to Kroger, which was having a givewaway for teachers. And who doesn’t love freebies? So, CHECK OUT ALL THIS COOL STUFF I got!! 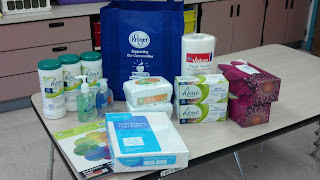 I got one free tote bag, one roll of paper towels, two boxes of tissues, two boxes of Ziplog baggies, one pack of copy paper, one pack of construction paper, two containers of wet wipes, THREE containers of antibacterial wipes, one container of each soap AND sanitizer ;), and finally, a box of bandaids (not pictured because I put it away and forgot about it before I took the picture)!! It was the BEST feeling…… I felt so cool with my free goodies (all from the SAME day), so I HAD to take a picture! Then, I went to dinner with the other teachers from my school to say goodbye to those who are leaving L. It was sad, because they moved our principal to a high school that’s about to hit rock bottom (I know they stole her from us because we’ve met AYP for the 3 years that she’s been with us … and she’s amazing anyways), and they are moving our bookkeeper to the same school. Our media specialist is moving elsewhere, and they had to relocate one of our first grade teachers, because they had to cut one class due to budget cuts. Ugh, so it was a sad night, but it was good to see everybody and catch up before having the stress of back to school preplanning. Today, I had to attend New Teacher Orientation (ugh), since I missed it when I first started in December. I also have to go tomorrow, but we got free breakfast and lunch, AND a stipend for going J. Then, to make it better, I got a BILO Gift Card from a raffle!! Woot! I’m rolling in all the luck now! Then, on Friday morning I have to go to the doctor, but then I should have the rest of the day to go back to my classroom and set everything up. J Talk about a BUSY week! What a typical way to wrap up a busy summer! 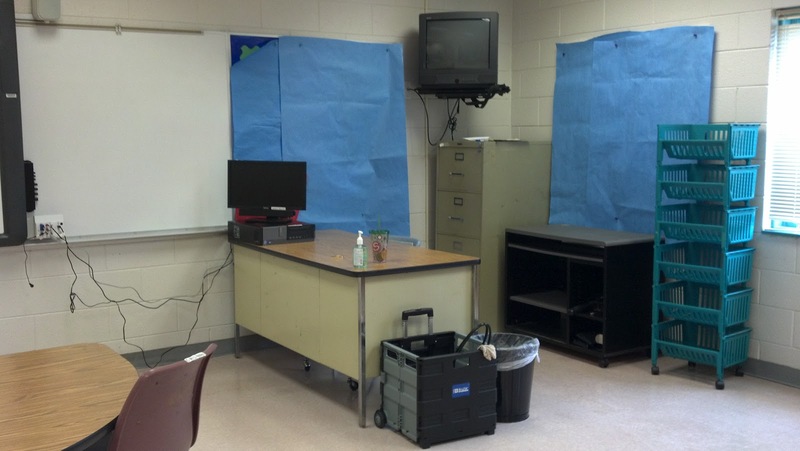 So in my first or second post, I posted pictures of the classroom when I left at the end of the school year. I went back yesterday to rearrange furniture, clean, and unpack a few things. I only got an hour of work done, but I will get to go back on Friday. 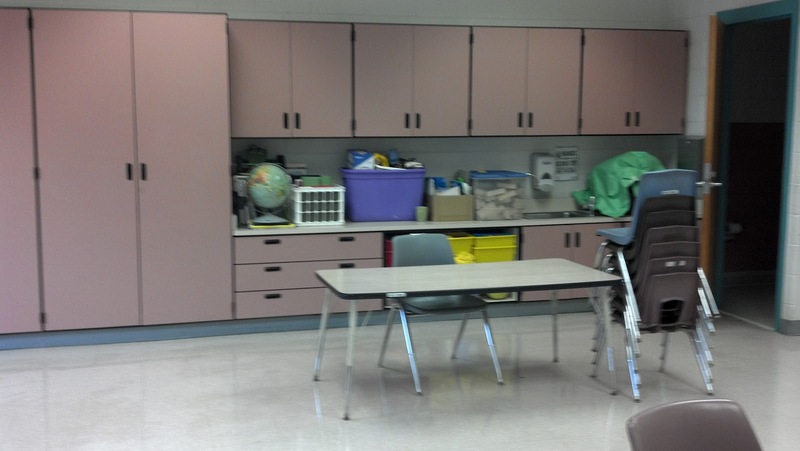 This is my new teacher area, which I am actually very excited about. Our room is wired in a very strange way so that there is only one internet connection at the front of the room - specifically for the ActivBoard Connection. 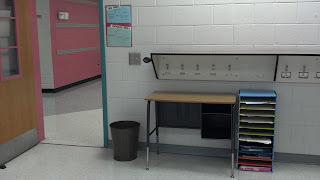 But most teachers put their teacher desks in the back of the room, right next to the student computer. There are two internet hookups in the back of the room. So last year, I ended up with two teacher computers that students COULDN'T use, and ONLY ONE student computer. It made no sense. So this year, I am HOPING to get two student computers for the back of the room, and make my ActivBoard Computer the same as my teacher computer. *As you can see, I still have my bulletin boards covered, to prevent dust, but I am taking them down next time I go back. :) But that's why they look so sloppy. Here's the back of the room, where I stored everything while they came in to clean the floors. I have to go through and clean out EVERYTHING on the counter, as well as everything in the cabinets... It's basically going to take FOREVER. After I clear everything off of the counter, this will become my writing center :) I'm really excited. I have many visions for this center. 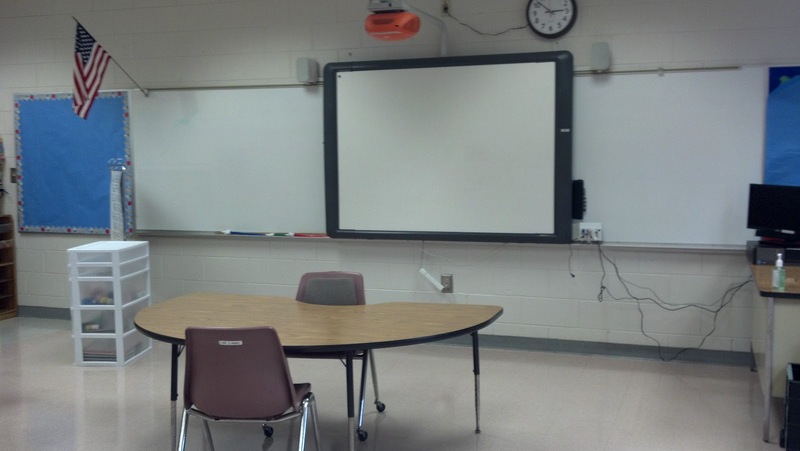 Here is the front of the room with my ActivBoard and small group table. I hope this works out to have the students facing the board. 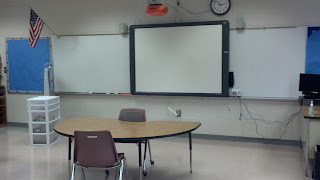 I barely used this table last year, but I also rarely used my ActivBoard last year. This year, I'm really hoping to use this table for the majority of each day. 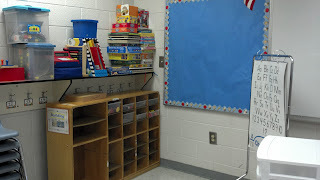 I am thinking this will be a station where students can sign in, put their homework folders, and stuff like that. I may put their behavior management buckets on the hooks. The blue mail slots on the right was a part of my writing center last year. I may change that this year. Not quite sure yet. 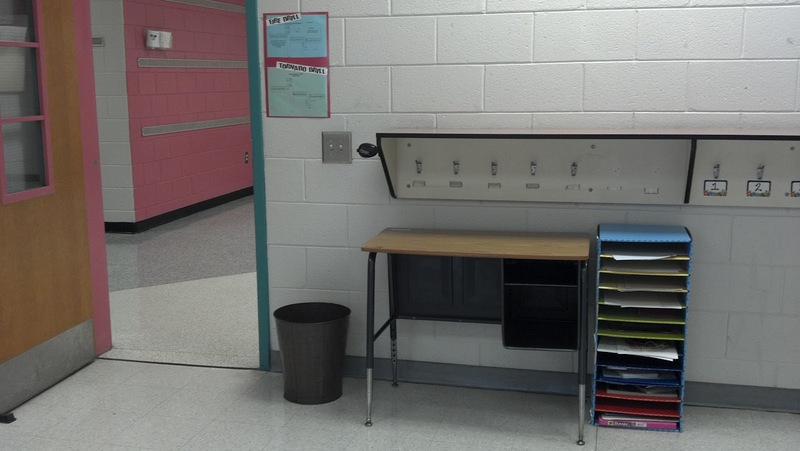 They will put their bookbags on the hooks to the right of this desk. 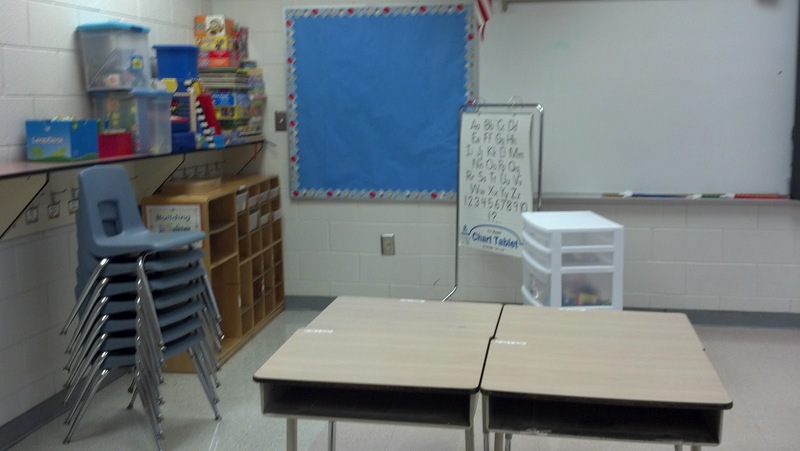 The four desks here are where the students will probably do independent work. Behind it is going to be my Calendar Math center. (I usually only do calendar with one child, so it doesn't need to be a big space) I am hoping to find a cheap rug for the floor right there. Then I am covering the shelf on the left with fabric to prevent distractions. 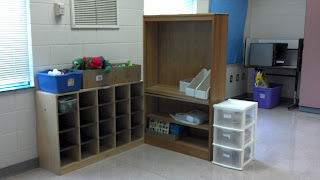 The shelf will be full of table toys and math manipulatives when I finish :). I have lots of labels to print out! 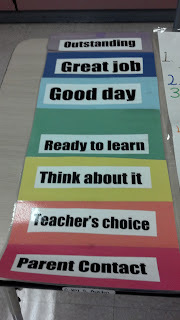 Here's my clip chart that I used last year. I thought about changing it this year, but I think I may keep it the same, and use it again for one more year. I think I may put it next to the classroom door this year right next to the rules chart. Thanks for checkin it out! I would gladly appreciate any comments with advice for setting up the rest of my classroom!